The Anthropologie Numbered Chest of drawers. It sold for around $1000 and is no longer for sale. I drooled. It was very vintage industrial with it’s stenciling. Could I transform my $50 work horse into something better than it alread was? YES! And here is how I did it. Supplies: 2 pieces of card-stock, tape, measuring device, xacto knife (no fancy Cricut machine), scissors, craft paint, and of course a piece of furniture. 1. Find an old chest of drawers. Any will do. Bring on the dings and the scratches. After all, we are looking for something that may have been used in an old store or work room where someone might have called out “grab me that wrench from the 2nd drawer!”. 2. 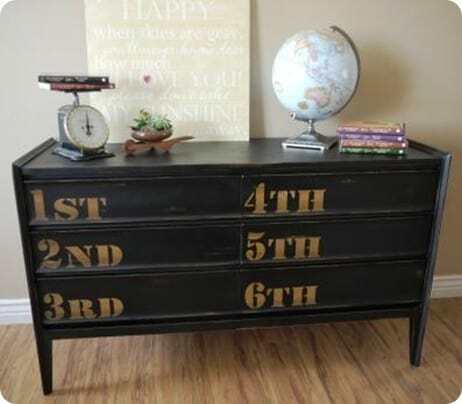 Make and print a simple stencil using a Cargo style font (or Click HERE for My Numbers Stencil pdf) My drawer front space for the stencil was 3 1/2″ X 7″ and I made my numbers fill the space as much as possible. If you down load my stencil, enlarge or shrink it to fit your drawer front. 3. Cut out the stencil with the xacto knife. I put mine on some fish wrap (newspaper) so that I wouldn’t cut my table. You might need to cut on both sides unless your knife is sharper than mine. Don’t worry if you don’t follow the lines exactly, it is supposed to be imperfect. 4. Pick out all of the black. 5. Cut the stencil to fit the drawer front and tape it down. 6. Dip the paint or chip brush (any old thing will do) into a tiny bit of your paint. Dab it off on the newspaper. Lightly, I repeat, LIGHTLY stipple the paint over the secured stencil. It is better to stipple many times than to glob the paint and have drips. I left some edges and corners of the letters with out any paint so that it looked like a rush job from 20 years ago. 6th. Remove the stencil and let dry. Thanks for linking to my dresser! I love your version. Love this… i want one like this in my own room! very cute!! This is fabulous! Love, love, love it! I LOVE furniture makeovers! This project turned out amazing Thanks so much for linking this up to Thrifty Thursday! Have you considered adding some relevant hyperlinks to the article? I think it might improve everyone’s understanding.